The title of this entry may be a bit facetious, but there is an element of truth to it. The written word is often taken as absolute gospel. That’s because most people, understandably, can’t be bothered to verify the facts themselves. It’s for this reason that I cite my references and sources whenever I quote anything, be it a statistic or a comment. And when it comes to statistics, I try to use neutral sources, like Statistics Canada, wherever possible. This way I get the true numbers before the spin has been added. The last number isn’t broken down into male and female victims, so for my purposes, I’m going to assume a worst-case scenario and say that all of the victims were female. That gives us a grand total of 67 women who were killed by their current or previous spouse or partner (51+16=67). 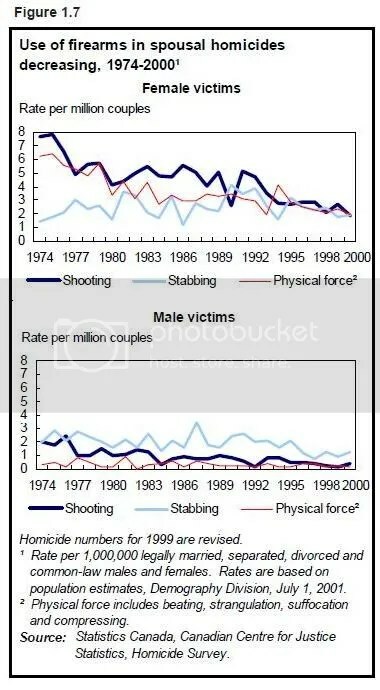 So with 162 women killed in total for the year 2007 that works out to 41% of female homicide victims being murdered by their partners. Not 85% as was so sensationally claimed in Ms Mandelman’s blog. Is that still a horrendous figure? Absolutely. But at least it’s the real figure and not a fabricated number designed to illicit an emotional response from the reader. According to the RCMP, there are about 2 million licensed firearms owners in Canada. Most estimates place the actual number of firearms owners at around 5 million people. That accounts for roughly 15% of the population of Canada. Call me crazy here, but if you’re heading a campaign to bring in new laws that will have an immediate and direct impact on 15% of the population, is it not too much to ask that you tell the truth?